FightForTheRail had the most liked content! Rookie Sportsmen to run with regulars at OCFS. How do you know someone is just not good or unwilling to spend money when they have been on the track before or never raced that class before? Flemington had a rookie class for years because the Sportsman (small block) had so many cars that rookies never got much track time. Flemington would run their rookie class early in the night and the top couple finishers qualified for the regular Sportsman feature. The rookie class ran until the beginning of June, then all rookie automatically moved up to the regular Sportsman. I think it is beneficial to allow new drivers a couple months to get more track time. Every one of those drivers you mentioned started racing at least 45 years ago. Saying that is how things were in 1951 or 1968 so that is the way things should always be isn't relevant to how the cost of racing how changed over the past 50 years. Uncle Tom going too hard in the paint for April. There is a near 100 percent chance of rain for tonight. Big Diamond will almost certainly have some lame, weak cancellations during the season, but last week and tonight are not it. The bathrooms in the infield at Williams Grove are fairly decent. Even the ones on the frontstretch are not horrid, but there are not enough of them for Outlaw crowds. They are real toilets that actually flush. I have not been to Five Mile in seven or eight years, but I know they were awful then. Suggesting port-a-johns over decent bathrooms just seems like an awful suggestion, however, for any place trying to get families to attend. Put up port-a-johns? Good luck trying to convince most girlfriends or wives to go to the track port-a-john, For that matter, it is 2019. Deplorable bathroom conditions weren't suitable at the Civil War prison camp in Andersonville (Ga.) in 1864; they sure as hell should not be acceptable at racetracks in 2019. The flip side of that is last night was yet another SDS race where half the race was run under yellow and people on here are bitching about paying top dollar to see so many laps run under caution.. There is nothing at all wrong with starting 24 cars in a feature, IMO. I think your standards of what is a "big dog" is pretty generous. When i would go to Windsor in the early '90s, Scott Pusell won back to back points titles without winning a race either year. He wasn't the big dog there, either, when Horton, Pauch and Hoffman would win just about every race and blow him away in doing so. I don't think a guy who wins a race every three or four years at a track is a big dog. You don't even have to go there. Just from looking at the results at that place, who would you say are the big dogs at that track? I am not trying to be negative in any way, but come on. The track ran the fewest points races in its history last year (13) due to all the rain. On a weekly basis or at the Sixer, is that one of the guys you think is a favorite to win there? He is a good racer; don't misconstrue what I am saying. But he's not in the same zip code as the big three at that place. I am surprised at how competitive Gular has been at OCFS, and hope he does great there weekly. But come on. He has four career wins in 15 years at Grandview. I don't think anyone would classify that as being the "big dog" at that place. Looking purely at the stock price also does not reflect if there were buybacks or dilutions in the past five years. Lots of companies have been buying back their shares in recent years to reduce the number of outstanding shares. Decker was a weekly regular in the 320s at Fonda. His first career win was in 1985 at Fonda. In, 1988, he switched to Lebanon Valley. There was "never" a reason to watch in the fall? Get out of here with made up claims that are obviously not true. Show us the year when a guy sat out 30 percent of the season and was crowned champion. The system now is a contrived, fake, phony sham that often effs the guy who had the best season. The problem is, there is not much point in watching or attending the majority of the races because the points format ensures that much of the season is meaningless. Grandview has always run big heats. 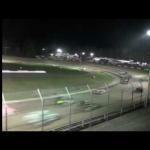 Back in the days of 9:1 Pennsylvania Tri-Track, the cutoff was 50 cars for four heats or five. As far as no improvements being made, most rational people realize the pace is not going to be around forever -- especially now that Bruce Rogers is dead.